KARL MAYER’s WEBSHOP SPARE PARTS is not a static buying system but a tool that is constantly being upgraded and improved. 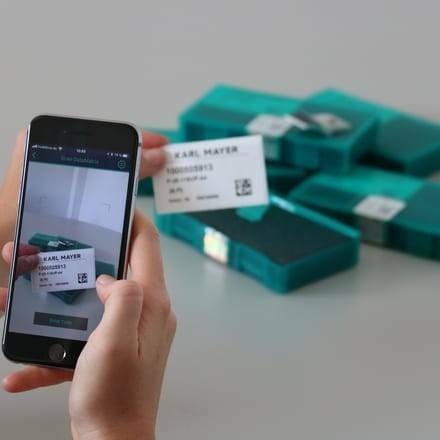 One of the latest new developments is the scan-to-order function – a feature for the quick and easy ordering of spare parts via a smartphone. This is available initially for needle units but will later be extended to other components. For this function, KARL MAYER has combined its CHECK PARTS app with the WEBSHOP SPARE PARTS facility. An order is placed simply by scanning the data matrix code on the check slip of the needle units, without having to input any additional data. The scanned products are added automatically to the webshop’s shopping basket and the ordering process runs automatically. This online process is even more advanced in China. The ordered item can be paid for directly using the popular Alipay payment platform. “China is ahead of us when it comes to modern payment methods. This is why we have adapted our process for our Chinese users,” explains Axel Wintermeyer, the Head of KARL MAYER’s Spares Department. This new function makes it even easier for the company’s clients to order spare parts during their day-to-day operations – for ordering on site, as well as for warehousing. If a part runs out, it can be reordered using automatic data transfer via the scan-to-order function, without incurring any additional internal administrative costs. Maintaining internal authorisation guidelines also enables user hierarchies to be established easily. In addition to the selected products, the WEBSHOP SPARE PARTS will also allow supplementary technical products to be ordered in future. This useful cross-selling function is new and will support customers when ordering spare parts. The number of available languages for the webshop at the company’s headquarters has now been increased to 12, and Korean, Chinese, Vietnamese, Indonesian, Thai, Portuguese, Italian and French have also been added. In June 2018, Japan started its own webshop, which generated a great deal of interest. “Many of our key customers have already registered,” says Tetsuji Yasumura, the Head of Product Management, Spare Parts. In the run-up to the launch, many companies on the Japanese market were already making enquiries about this easy-to-use online tool. With the setting-up of the Japanese version, the WEBSHOP SPARE PARTS facility is now available at every location in the KARL MAYER Group. The next changes are already being planned. “The feedback on our webshop is motivation enough for us to continue with it and expand the ordering system. Our aim is to be the ‘Best in Class’ in the online procurement of spare parts,” says Axel Wintermeyer when speaking about his objectives.